This form should be completed if you are an overseas applicant and want to be registered by the Nursing and Midwifery Board of Ireland (NMBI). 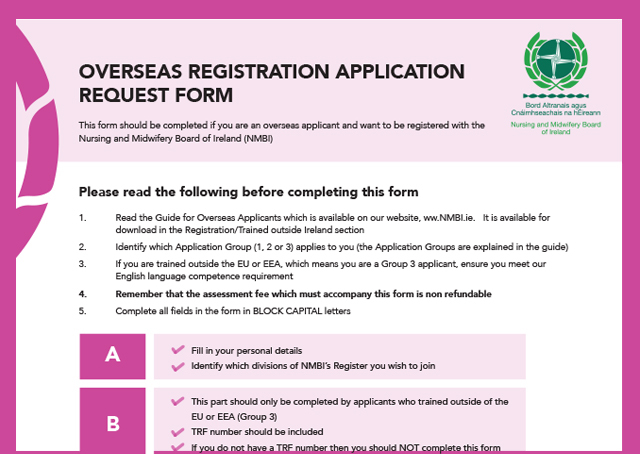 Before you complete this form, you should read the Guide for Overseas Applicants which is available for download on our main Trained outside Ireland page. If you are trained outside the EU or EEA, which means you are a Group 3 applicant, before you apply and pay the assessment fee, ensure you meet our English language competence requirement. You should remember that the assessment fee which must accompany this form is non-refundable.